IVF Risks & Complications - Should You Be Worried ? Over the years I have often contemplated what life would have been like without IVF (in vitro fertilization) treatment. There is no doubt that this treatment has brought joy to countless parents, who might not otherwise have experienced parenthood. That said, as with all treatments, there is always an element of doubt and any potential dangers should not be brushed over lightly. The potential risks of IVF to mother and baby have been widely discussed during the past 20 years, but do those fears have any foundation and is IVF safe today ? You’ll be relieved to know that the risks are actually perceived as slight, and acknowledged to be higher for babies born to moms who are older than 35 years of age. Further good news is that PGD (Pre-implantation genetic testing) is available and is a test which checks embryos. This enables doctors to pick the ones for implantation which are the healthiest and free from genetic defects. Firstly, I’m going to look at some issues associated with in vitro fertilization and, later, will look to see what’s available to minimize the IVF risks to mother and child. This can occur in 30% of women undergoing IVF treatment. This can lead to painful, swollen ovaries. and in which heartburn and sickness can result. The symptoms can be eased with medications although in more severe cases the woman might be hospitalized. This is a potential risk with IVF, and occurs when the fertilized egg embeds itself outside of the womb. In 2004, the BBC reported that Dutch researchers had discovered that premature births were approximately doubled in women that had conceived with the help of IVF treatment. This is open for debate but it has been discussed over the years. In 2002, Western Australia reported twice as many defects in babies born through IVF treatment. However, in a June 2010 report on the Medscape.com website, they found that approximately 4% of births following IVF treatment resulted in some form of major birth defect (e.g. intestinal malformations). But, it was reasoned that this is not actually any different to non-IVF treated births. Minor defects (such as a cleft lip or cleft palate) are also reported in this form of assisted reproductive technology. In October 2011, the Daily Mail’s online newspaper reported that moms were likely to experience a 50% increase in suffering from pre-eclampsia through IVF treatment. The theory being that the placenta might suffer changes as a result of the IVF treatment. Mothers that experience pre-eclampsia could be treated with drugs – at least to help the rises in blood pressure. Although blood-clots, and failures of the liver and kidneys are also common. In February 2010, Reuters news agency reported on a study that concluded that 5% of women who got pregnant with IVF treatment developed placenta praevia. This is compared with 1.5% of naturally conceived babies. This complication can lead to heavy bleeding and is more likely to occur with moms who have previously had a surgery on the womb such as a cesarean section. The New York Times on-line edition reported in November 2011 a summary of a Dutch research study. This concluded that women who had IVF treatment were over 4 times more likely to develop ovarian cancer. It should be noted, however, that ovarian cancer, even with IVF, is still relatively rare in women under 55 years old (0.71% of the population). Lupron is typically injected as part of the IVF cycle and it is used to dampen your normal hormone production. This enables the fertility drugs to work unhindered. As a downside to this, you might start to feel menopausal due to suppressed estrogen levels and this can result in hot-flushes, headaches, mood-swings and even depression. Acupuncture is an option to help the side effects caused by Lupron and there is a suggestion that it can actually improve conception. If you don’t want to run the risks posed by Lupron, mentioned above, then there are actually alternatives : Ganirelix and Cetrotide. Of course any medical treatment options should be discussed with your IVF fertility doctor first. Many women pin their hopes so much on IVF and expect this to the ‘Magic’ that they have been looking for. So when it doesn’t work, there is a real risk in the woman experiencing depression. Here, support groups can help greatly. You might think that this is a bit of a strange risk to hi-light. After all, for many parents that are trying desperately hard to have a child, they would do absolutely anything and pay whatever it takes. But you don’t want to be bringing up a child, having spent all of your money – or even worse having run up crazy debts what you are going to find difficult, if not impossible to pay off. This is not available everywhere, but you might want to ask your fertility clinic if they participate in such a scheme. Basically, it allows you to get a percentage of your money back if you fail to get pregnant as a result of your IVF treatment. Whilst this all sounds good, you MUST read the small print before you embark on any treatments. There are often lots of clauses that could trip you up and leave you further out-of-pocket than you might realize. Usually you will need to qualify for any such schemes. Not surprisingly, the companies offering the scheme want to ensure that they offer this to moms who are likely to actually get pregnant. Therefore reducing their own financial risk. This should not hold the fear it once did. Now there are some excellent clinics in, for example, Asian countries that offer treatments at a much cheaper rate than their western counterparts – even after you include transport and hotel costs. There are arguments which suggest that mothers are unwittingly setting themselves up for multiple IVF births. However, back in July 2008, the BBC ran an article reporting on comments made by Dr Norbert Gleicher, from New York’s Center for Human Reproduction : ” In my opinion patients are being misled and put to unnecessary expense” he said about the common view that twin pregnancies carried significant risks to both mother and child. How can you reduce the problems associated with IVF ? As we have seen there are IVF complications and therefore the aim is to reduce these risks as much as possible. With that in mind, I am currently working with fertility expert Diana Farrell, the creator of the The Full Embrace™ Pregnancy Success Program, who has produced an excellent IVF manual, titled The Full Embrace™ IVF Success Program. I really have struggled to find anything else to compare it with. 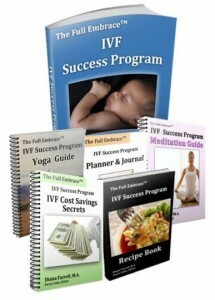 If you would like to see my in-depth review of this course, then click here : IVF Success Program review. If, however, you would prefer to go directly to Diana’s website to read more about the program and to hear from women who have succeeded with it, then please click on the image below. I hope you found this article helpful. Please feel free to share this information using the social media links below. Author : Maria Anderson is a researcher of women’s health issues. This article has been produced for informational purposes only and should not be taken as a substitute for professional medical advice.